"...Budo (the Martial Way) is not felling the opponent by our force; nor is it a tool to lead the world into destruction with arms. True Budo is to accept the spirit of the universe, keep the peace of the world, correctly produce, protect, and cultivate all things in nature..."
Aikido, the dynamic Japanese martial art, requires no use of physical strength. It relies instead on the use of technique to neutralise an attack and is therefore suited to to men, women and children of all ages. It is an art that involves throws, joint locks and immobilisations against one or more opponents. Practice also includes the use of the Bokken (sword), Jo (spear) and Tanto (knife). 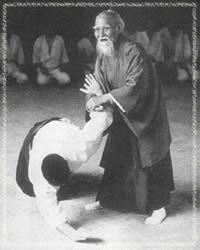 Aikido concentrates on using an attacker's own energy and momentum against themselves and places great emphasis on dynamic movement. Shun Poo Kan Aikido has been established in the United Kingdom in 1977, for the teaching of traditional Aikido, in keeping with the philosophy of the founder, Morihei Ueshiba (more often referred to as 'O Sensei' or 'Great Teacher'). Our organisation's experienced base of instructors caters for all age groups and welcomes all beginners. We have dojos at Trysull, Much Wenlock, Wigan, Sedgley (based at Trysull) and Gastonia in North Carolina in the United States. Shun Poo Kan Aikido is a member organisation of the British Aikido Board. The BAB is recognised by Sport England, formerly known as the British Sports Council, as the only governing body for Aikido in the United Kingdom.